US DOMESTIC SHIPPING IS INCLUDED. ALL PRICES ARE IN US DOLLARS. ORDERS FROM CANADA AND MEXICO, PLEASE ADD $7.00 FOR AIR MAIL SHIPPING. OVERSEAS ORDERS WILL BE BILLED OUR SHIPPING COSTS (AIR MAIL). KINDLY WRITE YOUR PHONE NUMBER IN "REMARKS" IN CASE WE NEED TO CLARIFY YOUR ORDER. And now, this is the Catalog of our Products and Services. To order an item, just click on the "Buy This" button and it will be placed into your Shopping Cart. To view items you have placed in the shopping cart, click on the buttons "View Shopping Cart" throughout this page. In addition to the above, it also includes three of our best-selling videos: "YOUR AIRLINE INTERVIEW," "101 REAL FLIGHT ATTENDANT QUESTIONS AND ANSWERS Tutorial" and "ENCORE - Additional 70 Questions and Answers Tutorial" - over 3 hours of instruction. Brand new 2007 edition. More than 300 pages will tell you every detail of how most specific airlines interview today. 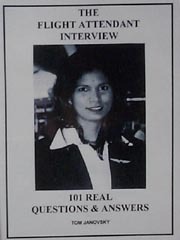 Includes over 170 real flight attendant interview questions with the correct answers. Covers, among others, Alaska Airlines, SkyWest, Continental, jetBlue and United, and on the international side it is Singapore Airlines, Silk Air, Qantas and others. This is an identical package as MFA 002 but includes a professionally prepared airline resume (see RESUME for details). "FL;IGHT ATTENDANT TRAINING" and "THE LIFE OF A FLIGHT ATTENDANT." In those 3 hours you'll see what an airline training is like, and what it is like to fly. Covers layovers in Prague, Vienna, Bangkok and Paris. A self-study program on U.S. and World geography. It is a must for any aspiring airline personnel. Enjoy studying and learning at your own pace. About 175 pages, 8 1/2x11". A general information book describing airline key jobs, how to contact airlines with instructions on how to build a winning resume and ace the intake interviews. 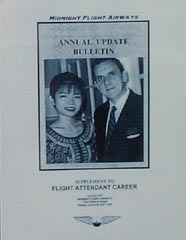 The long-awaited 250 page manual for flight attendants involved in, or planning on international flying, covers the standard and emergency announcements in the following languages: Mandarin (Chinese), Czech, Danish, Dutch, Finnish, French, German, Italian, Japanese, Polish, Portuguese, Russian, Spanish, Swedish and Tagalog (Filipino). This is a unique monthly newsletter which updates information on airline interviews, airlines and general aviation information. That's where you can also see what our clients have to say about their interviews. Distributed via USPS mail. 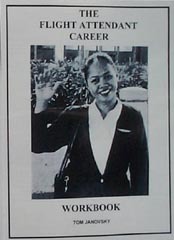 A 50-70 page booklet updating information in the original FLIGHT ATTENDANT CAREER book. Covers annual changes in airline interviews and brings you information on additional airlines which were not hiring until then. $9.95 (it comes free with our interview preparation packages). 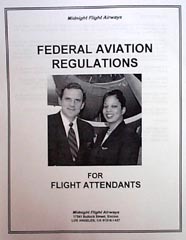 A complete set of the Federal Aviation Administration regulations for commercial aircraft cabin crews. Approximately 60 pages, 8 1/2x11. ALL VIDEOS ARE AVAILABLE ONLY IN THE NORTH AMERICAN VHS AND DVD FORMAT (NTSC). PLEASE, SPECIFY VHS OR DVD. Tom Janovsky, CEO, Midnight Flight, is going over each question and explains its importance, what the interviewer is looking for and the rationale for your answer. The tutorial is capped by a mock airline interview with one of our best successful clients. Comes with a booklet and a workbook. Tom continues with questions we collected over the past 5 years. Comes again with a booklet and a workbook. GET BOTH VIDEO TUTORIALS AND SAVE - IF YOU ORDER MFA 091 AND MFA 092 AT THE SAME TIME, YOU PAY ONLY $34.95! Prepare for the "battle" and learn the best strategies for your Open House or one-on-one interviews. Deals primarily with strategies for a winning second interview. 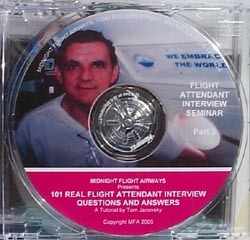 Includes our books "101 REAL FLIGHT ATTENDANT INTERVIEW QUESTIONS AND ANSWERS" and "ENCORE" with workbooks. Ideal for applicants with Singapore Airlines and Qantas. This program was developed for the new applicants to see the way United was testing (and video testing) new applicants. United conducts interviews very differently from other airlines. Our package includes the video test sample. Over 70% of our clients made it with United just using this package. Excellent guide also for Air New Zealand, Qantas and European Airlines. This video program features about 750 slides from a typical major airline 6-week training program from Day 1 to graduation. 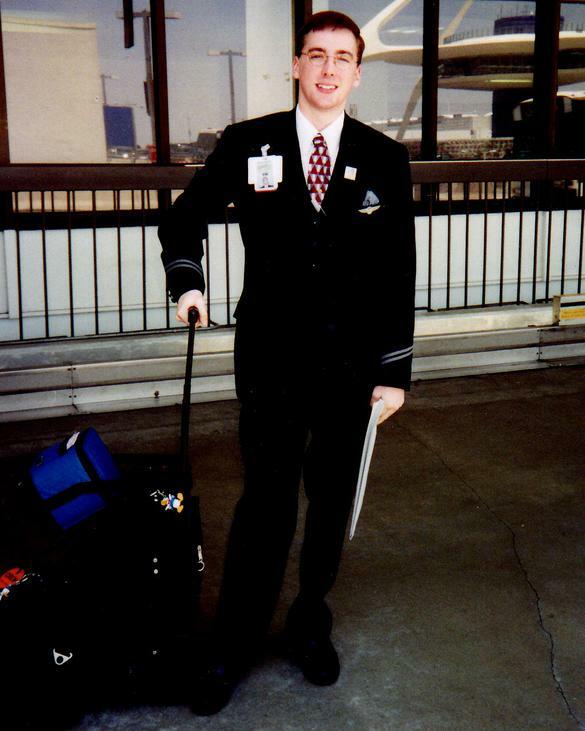 A must for anyone who is thinking seriously about becoming a flight attendant. Souvenir videos prepared for our clients who graduated from AirTran, American Airlines, American Eagle, Chautauqua Airlines, Continental Airlines, Delta Air Lines, jetBlue Airways, National Airlines (no longer existing), Omni Airways and Southwest Airlines. Each video is approxiamtely 1 hour long. Specify airline when ordering. A real life video following a flight attendant in his life at home and while working. The video also addresses family issues and will take you on layovers in Vienna, Prague, Paris and Bangkok. Orientation to the device, set-up and operation, accompanied by brief graphical explanation of the cardiovascular system and why the defibrillator saves lives. 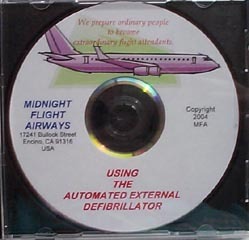 This program uses the Laedral defibrillator and is accompanied by an instructional booklet. A video guide to airline service excellence feturing flights on Air Jamaica, CSA Czech Airlines, Delta Air Lines, Delta Express, KLM Royal Dutch Airlines, Singapore Airlines, Thai Airways and a first class charter. Using our Boeing mock-up we'll alert you to all the possible hiding places for weapons and explosives terrorists use - and many other safety tips. Two VHS tapes or 2 DVDs. This aircraft has been popularized in the United States by jetBlue who used it exclusively until recently. You'll be shown the door operations both in normal and emergency mode. Accompanied by a booklet. The B-777 is the aircraft of choice for transoceanic flights by most international airlines in the world. 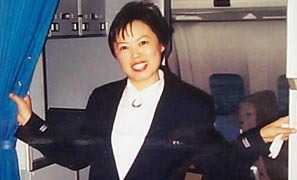 Join Linda, a major airline flight attendant, who is happy to give you a tour of this user-friendly giant in the sky, from the cockpit to the aft galley. You'll be amazed how much a flight attendant knows about the aircraft. Introduction to a true workhorse which is still in use with many charter airlines and will be used for decades by cargo carriers. Includes a vintage video of a pre-flight check by a flight attendant and part is filmed in our mock-up. This program will show you several versions of this most popular Boeing seller and you will even see the "glass cockpit." This tour from the cockpit to the tail ends with a great "toure de force" by the pilots who will also tell you what it takes to become a First Officer and a Captain on this kind of a bird. A "head-to-toe" guide to one of Boeing's biggest disappointments, the B-757. The aircraft, however, has been at times the sole choice for some airlines: National (went bankrupt a few years ago) and Song, which will shut down in May 2006. The airlines partially crashed because of the choice of this plane - it is not user-friendly, takes a long time to board an deplane and cannot compete with the B-737 or A-320. Yet, you'll work on it with every major airline. A detailed tour of the most versatile plane that is largely used on most transcontinental and some transoceanic routes. You'll see the features of this great plane from the cockpit to the aft. A tour of the plane that failed to compete sufficiently with any other Boeing product and will be gradually phased out. However, many major airlines have tons of them - mostly in the American Airlines livery - and you will work them sooner or later. GET ALL 7 PROGRAMS IN THIS VIDEO SERIES AND SAVE! ONLY $125.00 FOR THE WHOLE PACKAGE. A brand new version of our preparation seminar which has been the best preparation tool for some 6 years now. Replaces our seminar from year 2000. You'll get over 8 hours of video instruction to ace your interview - the program includes also our videos "101 FLIGHT ATTENDANT INTERVIEW QUESTIONS AND ANSWERS," "ENCORE" and "FLIGHT ATTENDANT INTERVIEWS." Upon successful completion you receive a Certificate of Completion, Midnight Flight flight attendant wings and a letter of recommendation based on your performance. This course consists of 25 lerssons covering in detail everything you'll be studying in your airline training. It is intended to reduce the stress level in your actual airline training. The first five lessons will prepare you for your application and interviews and the program includes our FLIGHT ATTENDANT INTERVIEW SEMINAR. The projected time for completion is 14 weeks provided you can dedicate at least 8 hours a week to your study (no television around, no kids around). The course includes ALL of our materials - books and videos - and is based on the standard FAA and ICAO curriculum. It includes unlimited consults in person or over the phone. Students who complete the course in 14 weeks or less with 90% sacore or better will receive their Diploma, Midnight Flight wings, and a strong letter of recommendation. All our graduates made it with airlines of their choice. You can be next. Hands-on instruction and practice are available on our B-727 mock-up. It is a 3-day crash course in Los Angeles and the program is outlined below in PERSONALIZED SERVICES. The correspondence course is a pre-requisite for the hands-on training. If joining the airline ground personnel is your wish, you'll succeed with this correspondence course. In 12 lessons you'll master the secrets of writing a successful resume, acing your airline interview and preparing for the career of your choice. Includes ON THE GROUND OR IN THE AIR book, WORLD GEOGRAPHY AND CITY CODES and a SCHOLASTIC WORLD ATLAS, unlimited consults and a FREE resume package. Successful graduates who achieve at least 90% in 6 weeks or less will receive a Certificate of Completion and a recommendation letter for the airlines. Don't let a poorly prepared resume to be the main stumbling block to your future in flying. We prepare professional airline resumes from the information you provide. You get 5 ready-to-submit originals, an original for additional coppying and matching stationery for cover letters. You'll also get the floppy with your resume on it and a sample cover letter. Where do you start? Send us your information. An intensive three-day practical course which runs through all aspects of airline flight attendant training and allows you to practice what will be learning with the airlines. Interested? Write us for a full course description. We cater to students for whom English is a second language. Personal guidance can be very important particularly if you have had several unsuccessful applications. We will prewpare you for your interview - and we will test-drive what you have learned in the mock interview to see that you are ready. If you live in the Los Angeles area, it includes a video session for your mock interview. Show your true colors! A blue license plate for your car, which reads in white print: "MY OTHER VEHICLE IS BOEING B-767." We are happy to show you here a few faces from our "WALL OF FAME," which features many of oure successful clients. You can be next! Alex K used our materials to make it with American Airlines. She approached Tom in Dallas to thank him for his assistance. It was the first time they met. 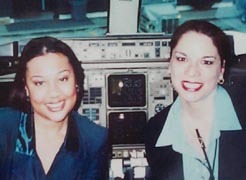 Kathy C from Florida (right) aced it with United, only to realize that her family meant a lot more to her than flying. "Thanks for the opportunity, Tom, she wrote when she returned homew, "at least I know I was good enough for it. It means a lot to me." Richard S from New Zealand met Tom on his international Air New Zealand layover in Los Angeles. "Your 101 Questions was the most helpful thing. It made the difference between making it and failing." Jackie S from Ohio aced it with American Eagle after our seminar. "With what I have learned, it was a 'walk in the park',"she said later. 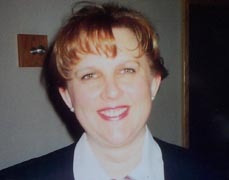 Cathy C from Midwest "fulfilled her life time dreams" when she was invited to training by Continental Express. Life was tough for Byron S. We assisted him to make it with American Eagle, and then he used us again to advance to American Airlines. He lost his job after 9/11 and we assisted him again to make it back to Eagle. All at no extra cost to him. Elaine T from Los Angeles went through our seminar and aced her United interview without a scratch. "It was like a deja vu," she said later. "I knew exactly what to expect." 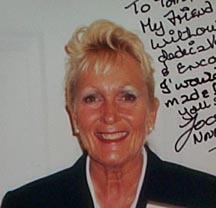 Jocelyne B from Florida took our course, and at the age of 61 still holds the record among our clients for age. 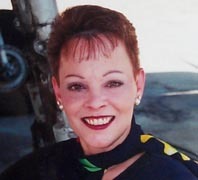 She is still getting letters from passengers for being one of the best jetBlue flight attendants. 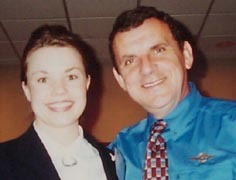 Tom pinned her wings on in New York at jetBlue graduation. Rose H from Arizona wanted only Southwest Airlines. Tom attended her graduation at Dallas Love Field. "I think it was the resume," Rose told Tom. 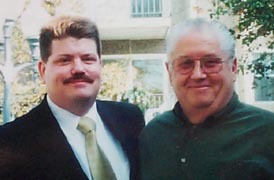 Richard S Jr. (left) reached his goald when he greaduated from Transmeridian Airlines. 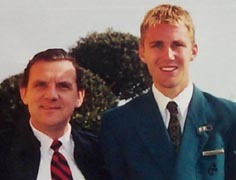 His father was at the graduation. "I'll always stay in touch," said Richard Jr., but unfortunately he tragically passed away (not aviation related) two years later. He was in touch always, though. 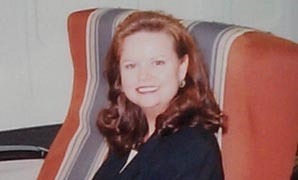 Agnes C from Georgia was 52 when she contacted us. We prepared her for her interview and got her resume ready and she made it at her first try with AirTran. "I owe you, Tom" she said when Tom flew to Atlanta for her graduation. 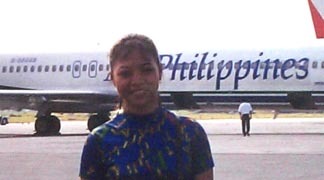 Geraldyne C from the Philippines made with Air Philippines. "I'll love you as long as I live," she said to Tom over the phone. Mei D from San Diego, CA came from China to the US only 6 months before consultation with Tom. She needed to learn more English and she went through our seminar. 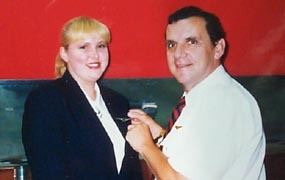 She aced her interview with American Airlines, and Tom pinned her wings on her in Dallas. 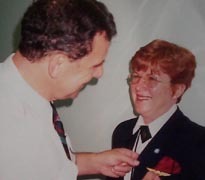 Betty S from Florida went through our seminar at the age of 51. 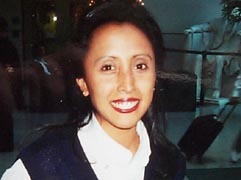 Two weeks later she was invited to training with Delta Air Lines. Two more of our clients were in her class - Tom flew to Atlanta for their graduation. 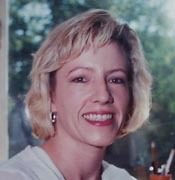 Elaine B from California was Tom's "trouble child." But with a lot of support from us she made it first with US Airways and after 9/11 we helped her again - with American Trans Air. "I knew I cvoul;d call you any time... it was always like coming home. You are the best." Al F went through our seminar before acing his interview with Chautauqua Airlines. "Thank God for your stuff," he said when he met with Tom at his graduation, "the training was tougher than my Air Force boot camp!" Janice M from North Carolina met Tom when he came to Atlanta for her niece's graduation. 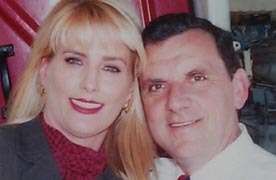 He helped her with US Air and Delta. "The world would be a better p[lace if we had more men like you," she told Tom. Jason H holds the records for being our youngest client. We worked with him for six months before he turned 19 and could apply with United. 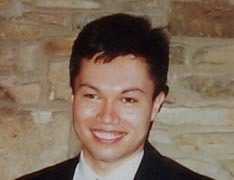 He was based in London, UK, a year after he graduated. "I did exactly what Tom told me, nothing more. It pays." Karen K went to 12 interviews before contacting Midnight Flight. She aced the next one three days later and was flying with American Eagle. Then we helped her to Northwest, but 9/11 cut that short. 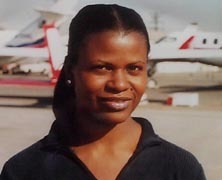 Karen flies now with Comair and is on our Staff. Tom pinned her wings on her at American Eagle. "I thank God I found Tom's website. 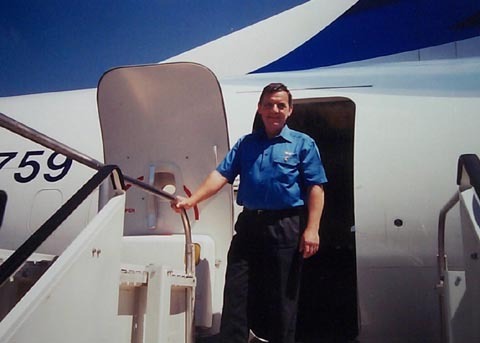 He helped me with US Air Express and then with US Airways." Lisa is from Los Angeles, CA. She appears in some of our videos. Pat H from Las Vegas got our help with National Airlines and Tom met her at her Las Vegas graduation. After National went bankrupt, Pat used us again to make it with jetBlue. She was 52 when she first contacted us. Professional guidance was never so affordable - and you get the best with us. 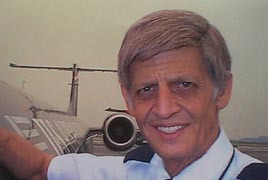 Tom Janovsky has been involved in aviation for more than 30 years and is a qualified flight attendant on most aircraft. 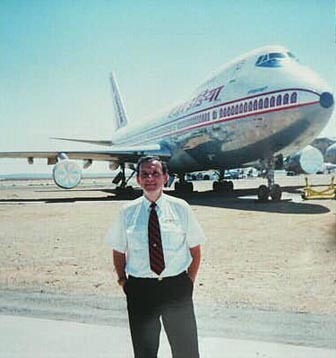 You can gain from his experience with Air Canada, Delta Air Lines, Singapore Airlines and TWA.